(JIS Article)It is a deed many would have shied away from, but then only 10 years old, Toni-Ann Miller, in a courageous act of selflessness, rushed into a burning building to save the lives of two children. A year following the incident, Toni-Ann, now 11, is being recognized by the country for her bravery and is to be conferred with a Badge of Honour for Gallantry at the National Honours and Awards Ceremony, to be held on National Heroes Day, Monday, October 20, on the lawns of King’s House. Her own safety was the furthest from her mind when Toni-Ann quickly responded to the cries of a little boy who was trapped in a blazing house, thick billows of black smoke signaling that he was in serious danger. Sharing her experience with JIS News, Toni-Ann recalls that she was on her way home from school with friends in the Mount Hermon community of St Catherine, when they came upon the burning structure, which Toni-Ann fearlessly entered upon hearing the desperate cries inside. After rescuing the six year old, who came away unhurt, Toni-Ann, who knows the child asked him for his younger brother. Learning he was inside sleeping, without hesitation, she again stared boldly into the face of danger, re-entering the building to take the five year old boy to safety. By this time, Toni-Ann notes that “half of the bed was burning”. The younger boy sustained minor burns to one of his arms. She says Toni-Ann unknowingly placed herself in extreme danger, recalling the account of an eyewitness on the scene who said the concrete to the front door of the house gave way just as Toni-Ann emerged with the second child. Judeen says she’s very proud of her cousin, who has been living with her since November of last year, and expressed amazement at Toni-Ann’s act of heroism, quipping that “(I) myself wouldn’t do that”. The question on many person’s lips, including her family is how Toni-Ann did it. Providing some insight, Toni-Ann shares that “I saw my father doing it already”. Confirming that he carried out an act of braveness about a year and a half ago, Melvern Miller says he is humbled that his daughter has followed in his footsteps, and is happy she was not harmed. Mr. Miller said when he realised a house in the yard he was living in, in Westmoreland was on fire, he raised an alarm and had to break down the door to rescue his brother and sister-in-law. He also dragged his nephew from the burning house. The 39 year old carpenter says he is still taken aback by the level of bravery displayed by his first child, noting that he is truly proud of her. He also has a three year old son. Mr. Miller lives with the mother of his son, Kadian Johnson in Bay Road Westmoreland, who helped to raise Toni-Ann from she was a year old until the age of nine. Her voice brimming with exuberance, Miss Johnson tells JIS that she is also proud of the braveness of her step-daughter, noting that when she heard of the news, “tears came to my eyes…I’m glad nothing happened to her”. 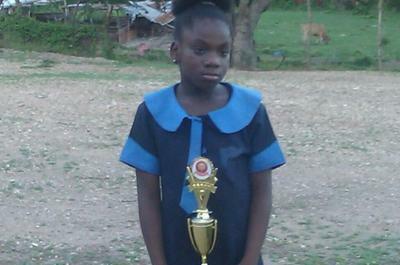 A student of the Mount Hermon Primary School at the time of the incident, Miss Johnson boasts that Toni-Ann is “very bright”, noting that she graduated second in her class from the early childhood institution she previously attended. “She studies a lot. She reads a lot of books. She hardly plays. I feel 100 per cent proud,” Miss Johnson adds. Toni-Ann is currently a Grade 6 student of the Good Hope Primary School in Red Ground St. In recognition of her bravery, Toni-Ann has been rewarded by the Jamaica Fire Brigade, receiving a trophy, bed, bedding and a basket of goodies including books and other school supplies. Toni-Ann’s story has also crossed borders to touch the heart of a stranger overseas, who learnt of the incident after Judeen posted details of the incident online. That individual has since sent cash to Toni-Ann through her school. Two children are alive today due to the quick action of a brave little girl, who, charging past helpless onlookers, placed herself at risk to save them. Had Toni-Ann not acted as she did, the children may have perished as the house, Judeen says, eventually “burnt down flat, flat, flat”. It is for the noble gesture that Toni-Ann, deservedly, is among the 233 outstanding Jamaicans, who will be recognised at the 2014 National Honours and Awards ceremony on National Heroes’ Day, October 21. The ceremony will be presided over by Governor-General, His Excellency the Most Hon. Sir Patrick Allen, and will be streamed live on the JIS website at: www.jis.gov.jm. What a brave child may the Good Lord continues to bless her and her family. I pray that she puts the Lord first and foremost in her life. Let's continue to encourage and pray for children all over the world. Let's start a fund for her.